For the mysteries of the Body and Blood of your Son. We may experience the richness of this Holy Banquet. 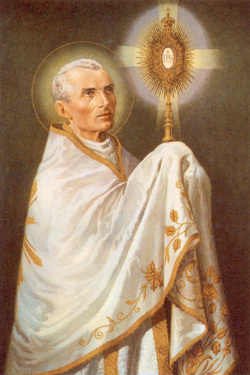 "The greatest grace of my life has been a lively faith in the Blessed Sacrament since my childhood. 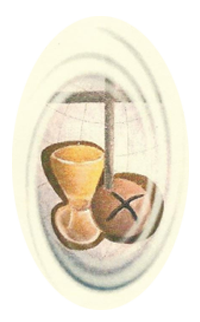 The Holy Eucharist is Jesus, past, present and future." He felt that the spiritual indifference of his times could only be changed by the fire of Eucharistic love. Exposition of the Blessed Sacrament became the sign of that love. 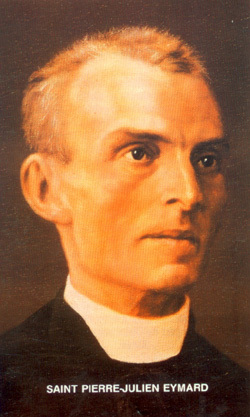 He encouraged perpetual adoration as a response of love and frequent communion as a source of strength for the Christian life. "The only remedy I know to combat the spiritual indifference of our times is to surround it with fire, the fire of the Eucharist." 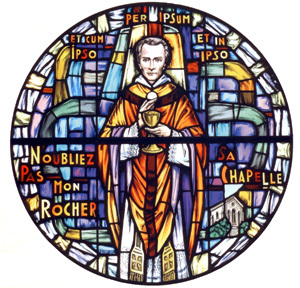 St. Eymard taught that Eucharistic prayer proceeds according to what is called "the four ends of the sacrifice of the Mass." This form of prayer unites us to the liturgy of the Church through the four attitudes that shape our worship in the eucharistic celebration. At any time, we can enter into prayer calling to mind the Mass we celebrated - or will celebrate - and the four movements of prayer found in the Liturgy of the Eucharist: Adoration -Thanksgiving - Reparation - Intercession. St. Peter Julian's spirituality expressed itself primarily, like St. Paul, as a focus on the Person of Jesus. Jesus is the Center and meaning of our lives, our Friend. He urged us to live for Jesus, with Jesus and in Jesus. His favorite model for prayer was Mary sitting at the feet of the Master, listening to Him, loving Him, silent in His presence. "Think of God, talk to him about Himself and you will find joy in His goodness - overflowing joy because of overflowing goodness."